Our Montana trip this year was quite special for Trent in several ways. First, Clayton Paddie and Trent became close friends while in college at the University of Arkansas. After graduation Clayton moved to Montana and has been guiding there all these years and this was the first time the two had seen each other since graduating from college. 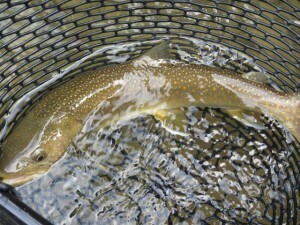 The next special thing for Trent was a Bull Trout. These are very special fish that exist only in the Columbia River drainage in the lower forty-eight states. 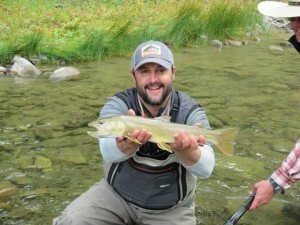 The lower Blackfoot River is one of those streams with a healthy, but small population, of Bull Trout. By state law you are not allowed to specifically target Bull Trout and if you are lucky enough to catch one they must be released! Perhaps not the fish of a lifetime, they are still prized as they are rarely caught and can grow to well over thirty inches in length. Early on our first morning on the lower Blackfoot River Trent asked Clayton what it felt like to get hooked up to a Bull Trout. Clayton replied, “it is like being tied to a dump truck!” Not two minutes later Trent raised his rod and announced that he was hung up on a rock; then the rock moved! Clayton’s next two words were, “dump truck!” Indeed, Trent had the good fortune to hook a beautiful 22″ Bull Trout and for the next ten minutes Clayton did masterful job rowing the raft and maneuvering to keep the dump truck from running underneath the raft along with avoiding several big rocks and huge root wad. 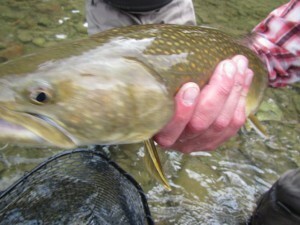 As you can see in the photos above, this Bull Trout looked a lot like an Arctic Char with beautiful greenish gray skin and opaque pink and yellow spotting. After some real quick photos the Bull was quickly released and the two old friends first sat and just stared at one another and then the laughs and hugs began all around! It was really a wonderful moment for two very old friends to share together. Special friends and special fish just go together. What else can you say? P.S. 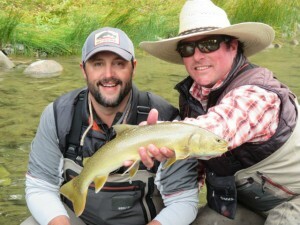 Many thanks to Clayton Paddie and Blackfoot River Outfitters in Missoula, Montana.